Indoor air quality problems can take a toll on your family's comfort and health. Dust, particulates, household chemicals and allergens can accumulate, making the air in your home dirtier than the air in a large, crowded city, according to the U.S. Environmental Protection Agency. Homes can also be damaged by unbalanced humidity, especially in winter when air loses its moisture content. Precision Air – a Carrier Indoor Air Quality Expert – has the answers. We can test your air quality, and if there is a problem we can install a whole-house filtration system that works with your heating and/or cooling system to remove nearly all airborne pollutants. Many systems employ the same technology used by hospitals and high-tech factories to purify their air. Filter systems can be supplemented with UV lights that kill airborne mold and bacteria. We also install whole-home humidification systems that protect your health and furnishings from the ravages of over-dry air. If you think your home needs air purification, please call us or send us an e-mail. Homes and buildings that have a central air conditioning system and/or a warm-air heating system can use enhanced air filtration to eliminate airborne contaminants and improve indoor air quality. 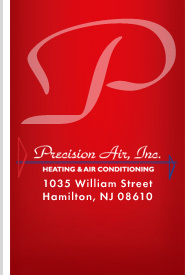 Precision Air can add a filtration unit to your system or upgrade an existing filter system for improved performance. A high-efficiency filter protects your family's health by removing fine dust, pet dander, pollen, mold spores and more. Excessively dry indoor air can aggravate health problems and cause damage to wooden furnishings, trim and floors. Indoor air can become especially dry in winter, because cold air contains less water than warm air does. Dry air contributes to problems such as chapping, dry skin, and irritations of the throat and nasal passages. It also causes wood to dry and crack. Precision Air can restore moisture to your indoor air with a whole-home humidification system. The system works with a warm-air heating system to raise the humidity level throughout the house. Mold and bacteria can accumulate inside a heating or cooling system and introduce contaminants into the air you breathe. You can fight back with a whole-house air purification system that uses germicidal UV lamps to kill organisms that might grow in the moist environment of the air conditioning or indoor coils. Your air will be cleaner and fresher, and your family will be protected against airborne illnesses. Tightly sealed and insulated homes are great for eliminating drafts and keeping energy costs down, but the indoor air can grow stale from inadequate air exchange. The best way to introduce an appropriate quantity of fresh air without sacrificing energy efficiency during very hot or very cold weather is with an advanced ventilation system. Precision Air installs systems that heat or cool fresh air as it is introduced to the house (depending on the season), so that the air is always fresh, but the heating or cooling efficiency is not compromised. To find out how you can improve the air quality inside your home or building, please call Precision Air today or send us an e-mail.